PRODUCT DESCRIPTION: Slightly larger then the 3.5×3.5 model, this Excluder can be used on bigger sized entry holes. This is a specialty "valve" designed to "exclude" or keep animals from entering through very specific locations. This valve should only be used in certain situations. Animals that are excluded will many times chew new entrance holes so it's not advised to just exclude them without relocation. Only in rare situations will a simple exclusion resolve the problem. This model features 4 flaps on one end which are attached over the hole through which the target animal is passing. It works as a one way valve allowing animals to exit but not enter. 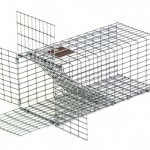 Built with 1/2" x 1" mesh wire, it features a spring loaded door that will be pushed up and open allowing animals to pass through and exit unharmed. Once out, the door will fall down behind them and they will not be able to get back in. 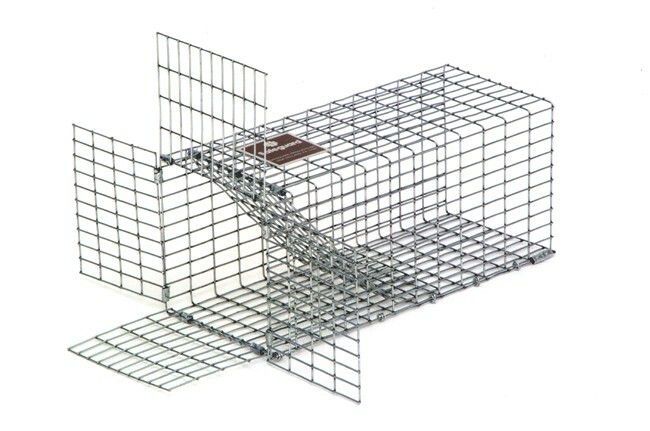 Use in conjunction with our repeater trap (822305) 5" x 5" x 30" RD for best results. This is essential if you do not intend on sealing/excluding all potential access points. WHERE TO USE IT: Directly over the exit/entrance openings. RATE OF APPLICATION: One per opening.